Vacuum Tube Lifters – A versatile load handling system. Vacuum tube lifters are a unique lifting aid designed for repetitive handling of smaller materials or loads. A tube lift system increases productivity while offering an ergonomic solution to material handling needs. These systems hold, lift, and lower the load all with a single operator control, and require minimal operator training. The use of interchangeable attachments allows for a variety of shaped and sized loads to be handled without the need for multiple systems. Variable material handling with same lifter. A double vacuum tube lifter that can also be quickly switched to a single tube for faster handling of smaller loads. Vacuum tube lifters can handle raw materials, rounded cans, bagged goods, parcels, cardboard boxes, luggage, windows or doors, OSB and wood products, and more. They are suitable for warehouse operations, assembly line production, or high-volume product handling needs. Vacuum lifters save you money and time by reducing the constant starts and stops that cut into your productivity, reducing worker fatigue and injuries, and reduce load damage caused by clamps and slings. Vacuum tube lifters can be the end effector for jib cranes and articulating jib cranes as well as overhead crane systems. Want to see a vacuum tube lift in action? We can show you! 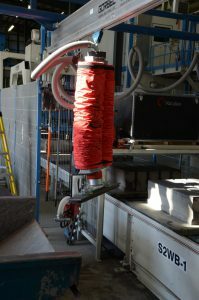 Check out this case study to see a double tube vacuum lifter in action.